A healthy dose of fresh thyme and parsley along with a variety of mushrooms ensure a complex flavor that will satisfy meat eaters and vegetarians alike! Friendsgiving is a pretty awesome holiday. Like Thanksgiving, it usually involves a traditional set of dishes like a turkey, cranberry sauce (complete with a debate over whether or not you slice the kind from a can) and stuffing. It also includes the added bonus of being celebrated with the people you choose to involve in your life, not just the ones that are lucky enough to be your family. Often we do not spend holidays with the people we let in to our lives from outside our families, and Friendsgiving is the perfect time to do this. There is no stress about who makes better stuffing (um, me!) or if you deviated from the family pumpkin pie recipe. There is plenty of laughter and maybe even a few drinks. A lot of fun and ridiculous stories. This year, I brought a gluten-free mushroom stuffing, my famous apple & sage gluten-free stuffing and some pretty spectacular gluten-free cupcakes. Mostly, I wanted to eat stuffing. (I would argue that it is the best part of any Thanksgiving feast). So, I have to make it. Then I know that it is gluten-free and safe for me to eat. (Although, this year my friends were pretty great. Someone bought gluten-free animal crackers and someone else made sure the chips & dips were safe for me to enjoy). 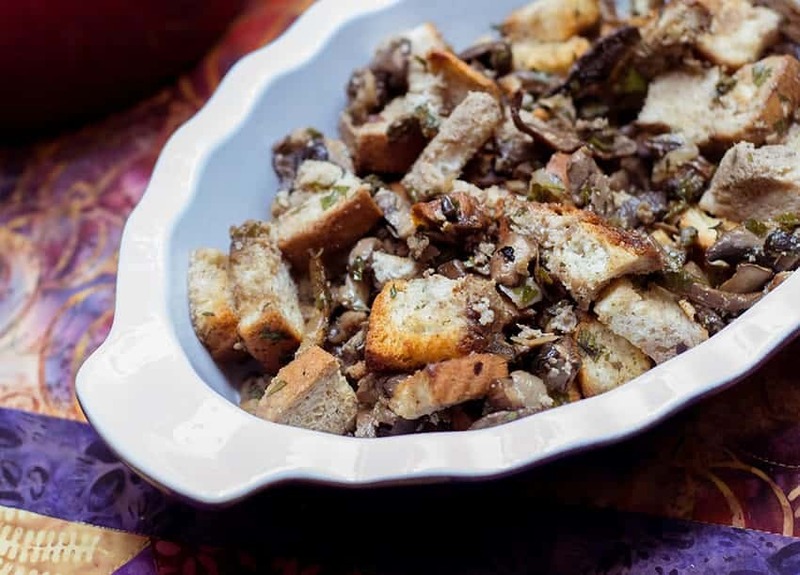 This gluten-free mushroom stuffing recipe happens to be vegetarian, but that doesn’t mean it is lacking in the flavor department. A healthy dose of fresh thyme and parsley along with a variety of mushrooms ensure a complex flavor that will satisfy meat eaters and vegetarians alike (as long as you don’t actually stuff it in the bird). Mushrooms + turkey = a match made in heaven. Mushrooms + corn casserole + cranberry sauce = happy vegetarian guests. Mushrooms + gluten-free bread = happy gluten-free you! This recipe is perfect with Udi’s Gluten-free Multi-Grain bread. It is best if you freeze the bread overnight, as this makes dicing the bread easier. If you don’t have time to freeze the loaf, just tear the slices to keep from smashing the bread. This recipe was adapted from one in the November/December 2011 Jamie Magazine. We have made it at 2 Christmas dinners, 2 Friendsgivings and 1 Thanksgiving. It has become a family standby – it isn’t even in a magazine anymore. That’s how you know it’s good – it is now just a page clipped and saved in a binder. Pour the boiling water over the dried mushrooms and set aside. Grease an 11×13 baking dish with olive oil. Dice the loaf of bread and set aside. In a large skillet, over medium heat, heat the olive oil. Add the shallot and garlic and cook until translucent and soft, but not yet golden (about 5 minutes). Drain the porcini, reserving the soaking liquid, and add them along with the other mushrooms, bay leaves and thyme to the skillet. Cook until the mushrooms are softened. At this point, if you are cooking ahead, stop. You want to assemble the stuffing right before putting it in the oven. Preheat the oven to 350 degrees (if your oven is a little hotter because of other dishes, you can adjust the baking time). While the oven heats, let the mushrooms cool slightly. Remove the bay leaves. Strain the reserved soaking liquid to remove any grit from the dried mushrooms. Stir together the mushrooms, the diced gluten-free bread and the parsley. Spread evenly in the baking dish. Pour the reserved soaking liquid slowly & evenly over the stuffing. You want to moisten the stuffing but not soak it. You may not need all of it (although I always have). Cover the dish with foil and bake for 35 minutes covered. Remove the foil and bake for an additional 10-15 minutes. You want the bread to start looking nice and golden brown. *Freezing the bread makes it easier to cube. If you are using room-temperature bread, it will smush less if you tear it. For added crunch, you can stir in some chopped pecans, hazelnuts or walnuts before baking. This entry was posted in Dairy Free, Dining Tips, Recipes, Side Dishes and tagged celiac, Friendsgiving, gluten, gluten free, mushroom, stuffing, Thanksgiving, turkey, Udi's. Bookmark the permalink.